June 13, 2012 - ElectriPlast Corporation and makers of the ElectriPlast line of electrically conductive resins, and aircraft manufacturer Volta Volare an emerging leader in electric flight aviation technology, announced that they have agreed to collaborate in the research and development of next generation applications and products using hybrid composites and advanced lightweight materials for the aviation industry. Volta Volare' and its subsidiary Volt Aero Technologies, based in Portland, Oregon, reached a milestone with the recent launch of their groundbreaking GT4 aircraft, the world's first hybrid electric, full-sized high performance aircraft. The Volta Volare GT4 was announced in April 2012, it will utilizes a standard canard pusher airframe and is expected that it will be able to fly up to 300 miles (480 km) on electric power alone. In hybrid mode, a supercharged 1.5-liter displacement gasoline engine with a 23 US gallons (87 l) fuel tank will back up the electric system and extend the GT4’s range up to 1,000 miles (1,600 km). Powered by the Volt Aero Technologies EViation Drive system, the GT4 is said to be the most technologically advanced private aircraft available. 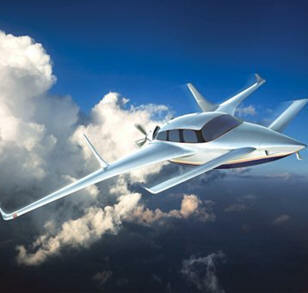 The all carbon fiber aircraft features a canard wing design to prevent stalls, a touch screen glass cockpit with synthetic vision and heads-up display to reduce pilot workload, and the EViation Drive system has one primary moving part, all incorporated to significantly enhance the safety of private aircraft. "Nowhere is lightweighting more important than in general aviation where there is a direct correlation between weight and performance & safety," states Paul Peterson, CEO of Volta Volare'. "Working with ElectriPlast we will develop new lightweighting solutions for Volta Volare' products, which can be widely applied to the general aviation and aerospace sectors." Further, he added, "Even those aircraft manufacturers that still utilize internal combustion and turbine engines can benefit from this research and development, and every improvement in safety and performance that we can deliver is in service the industry and our country's economy. We're pleased to be collaborating with the innovative team at ElectriPlast to accomplish these critical missions." ElectriPlast is a patented line of non-corrosive, electrically conductive resin-based materials engineered to replace traditional metals such as steel or aluminum. Typically used for electrical and magnetic shielding applications in industries such as automotive, aerospace, consumer electronics, cable and alternative energy, ElectriPlast can be molded into any of the infinite shapes and sizes associated with plastics, rubbers and other polymers while reducing component weight by 40 to 60%. "The GT4 represents a historic milestone in aviation and defines the next generation of private aircraft," states Herbert Reedman, CEO of ElectriPlast. "Innovation, drive and desire for advanced, next-generation technologies is what drives our two companies. We look forward to working with Volta Volare' to develop lightweighting solutions which incorporate ElectriPlast conductive resin technologies for use in aviation." Volta Volare' Corp. is a private aircraft manufacturer and emerging leader in hybrid electric aviation technology. Their EViation Drive System is the world's first and only hybrid-electric drive system in the field of aviation. The EViation Drive powers the carbon composite 4-seat GT4 aircraft with exceptional speed, safety and range, with a spacious and near-silent cabin and at the lowest operating cost of any aircraft in its class.